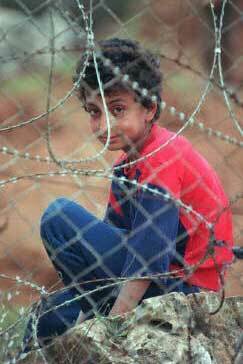 A young Palestinian boy looks through barbed wire near Hebron, January 7, 1997 (Photo: Pascal Guyot/AFP-Getty Images). She didn't cry or seek pity, just a little recognition. Her gray hair and lined face indicated that she was somewhere in her late sixties or early seventies. But the eyes, although wrinkled, were still soft, lifting at the corners when she smiled and spoke about the place where she was born, a tiny village in what is now northern Israel. The camera moved from her aging features to a young girl, no more than 12. "My granddaughter asks me if this is our home," the old woman said on the April 29 Al Arabiya Satellite Channel program. "But I always tell her 'no, our home is in Palestine and if God wills it, we will return'." The unnamed woman would, according to United Nations Relief and Works Agency (UNRWA) statistics, be one of the 394,532 Palestinian refugees in camps in Lebanon. She speaks passionately of the fig and olive trees her family owned, of her love for the land and for Palestine. "This will never be my home," she says of the squalid, overcrowded and poverty-stricken Ein Al Hilweh camp where she has lived for over half a century. The Palestinian refugee issue, now 56 years old, is as thorny and complicated as it was back in 1948 when some 800,000 Palestinians were forced to flee their homes during the war that resulted in the creation of the state of Israel. Today, according to UNRWA, there are approximately 4 million registered refugees in the West Bank, Gaza Strip, Jordan, Syria and Lebanon. Some have been twice displaced, losing their homes again during the 1967 War. The Palestinians - leadership and people - have always maintained that those who were exiled from their land in 1948 and 1967 have a right to return to their homes and properties, a claim anchored in international resolutions. In December, 1948, just months after the establishment of the Jewish state, the UN General Assembly issued Resolution 194 on the question of Palestine. Article 11 states: "The refugees wishing to return to their homes and live at peace with their neighbors should be permitted to do so...and that compensation should be paid for the property of those choosing not to return..."
Over 50 years later, a harsh reality has been driven home. The right of return, although alive and well in the national rhetoric of the Palestinian leadership and in the hearts of its people, has been shuffled aside, discredited and disregarded by everyone from Israeli leaders to some Palestinians themselves. It is considered one of the major points of contention between Palestinians and Israelis at the negotiating table and is also one of the most emotionally charged. But it was not always about politics and causes. Back in 1948, Palestinians believed their exile would be temporary and their return would be a matter of days or weeks. Jameela Flayaan says her mother left feed for her 100 chickens when they fled their village of Al Sidr during the 1948 War in the hope that they would not starve during the few days she was gone. Her neighbors even forgot their baby in its crib when they made their hasty exit and had to sneak back into the besieged village at night to retrieve him. Flayaan, a 47-year-old housewife who sometimes cleans homes for a living, is from the Jalazon Refugee Camp north of Ramallah. Although she was born and has lived in the camp her entire life, she speaks of her village, once located near Al Ramleh, as if it were she and not her parents that lived and later fled their home. "The year of the Nakba was such a fertile year," she says, in reference to the 1948 exodus. "The corn grew to a meter high, sometimes a meter and a half." She says her parents were newlyweds when the war broke out and her father had to hide among the cactus plants that designated the village's borders when the Hagana raided, in order to save his own life. "It took my mother and aunts three days to pick the thorns out of his back." This kind of nostalgia is nothing unusual among second and even third generation refugees who almost always mention their original villages or towns when asked where they are from. Flayaan's friend, Fatimeh, lives together with her husband and nine children in a small, cramped house in Jalazon. A tattered carpet is spread across the un-tiled floor and the women sit drinking tea and eating a modest breakfast of yogurt, tomatoes and cucumbers. "I will not move anywhere else, even if they offered it to me," she says when asked if she would accept to be resettled as part of a final peace agreement. Fatimeh, who is originally from the now destroyed village of Beit Nabala near Tel Aviv, says compensation is not acceptable either. "The loss of your land and home can never be compensated." Jamal Hindi, head of the Refugee Affairs Committee in the Legislative Council couldn't agree more. "Any future agreement that does not incorporate the right of return must be considered null and void," he says. A refugee himself, Hindi is intolerant of any proposition that undermines the historical understanding of this right. He is scathing about fellow Palestinians whom he perceives to have taken such a direction. "The [Refugees Affairs] committee called for those behind the Geneva Accords to be socially ostracized," he says. "Those accords not only harmed our national unity, they were an insult to our principles and national demands." The Geneva Initiative, signed in Switzerland in October 2003, created a flurry of reactions from both Israelis and Palestinians, much of it negative. The non-binding initiative, whose chief signatories were former Israeli Labor Party leader Yossi Beilin and former culture minister Yasser Abed Rabbo, was criticized by many Palestinians because of its solution to the refugee problem. In a nutshell, the initiative dictates that among the options given to refugees, the option to return to their former homes or properties in Israel "shall be at the sovereign discretion of Israel." In other words, no more talk of the right of return. Hindi also brushes aside U.S. President George W. Bush's position on the issue as expressed in his recent letter of guarantees to Israeli Prime Minister Ariel Sharon, which called for a return of Palestinian refugees to the future Palestinian state. "Not Bush or anyone else can decide on our right to return," Hindi says. "This is a national and legitimate right of all peoples." The question is, can the leadership maintain its position on the refugee issue and still advocate the two-state solution? Yes, says Ingrid Gassner-Jaradat, director of the Badil Resource Center for Palestinian Residency and Refugee Rights. "The right of return is an individual right, so in principle, it could be resolved within a two-state solution framework," she says. This right, she maintains, does not contradict with the two-state solution per se because this kind of solution would be a territorial compromise. "The problem, however, is that the Israeli side always insists that it is not just recognition of the state of Israel but of its Jewish character." Given this, she continues, there has never been an Israeli government and never will be one that does not rule out any right of return to Israel for Palestinian refugees. However, this is more or less a moot point at present, Gassner-Jaradat contends. With the current situation and the complete breakdown of the negotiations process, the issue of refugees has been pushed to the back burner yet again. "Even speaking about a future Palestinian state is ridiculous at this point," she says. "It doesn't really matter what they [Israelis] say now because they are doing everything possible to undermine the establishment of a Palestinian state." Still, like Gassner-Jaradat, there are people who strongly believe in keeping the cause alive in the hope that someday the injustice will be rectified. Hindi, born and raised in the Jenin Refugee Camp, proudly states that he is from Al Mansi, a village in the Haifa area. The name, ironically, means "the forgotten one." And then there is Shareef, a 22-year-old architecture student at Birzeit University whose parents fled their town of Majdal Askalan in 1948 to the Gaza Strip. Young and vivacious, he says if given the opportunity, he would return tomorrow to the hometown of his parents, but nowhere else. "My father still has the deeds to our land," Shareef says. "He still has my grandfather's passport from Mandate Palestine." Other remnants of their past lives are preciously preserved in their home in Gaza City - a new home after years in the Jabalya Refugee Camp. "We still have the keys to our house," Shareef says, which he adds is still standing today. "My uncle kept my grandfather's belts and my grandmother's scarves and embroidered dresses." Shareef's parents have passed down their memories to their son with painstaking detail. On the night of their exile, Shareef relates, Israeli fleets were shooting at Acco and Madjal Askalan. His grandfather, the most prominent landowner in the village knew he could not take his eagle - his most prized possession - with him, so he decided to take its fledglings. "When he put his hand in the nest, the eagle bit his finger," Shareef says with a little grin. But the symbolism is not lost on his grandson. "The scar is still there. Every day since then, he has had a reminder of the eagle and the home he was forced to leave behind."